Along with the International Association for Suicide Prevention (IASP) and the World Health Organization (WHO), we are committed to preventing suicide. These organizations recognize World Suicide Prevention Day as an important day in the international calendar. World Suicide Prevention Day brings together individuals and organizations with an interest in suicide prevention, and mobilizes efforts to save lives. Efforts to prevent suicide have been celebrated on World Suicide Prevention Day – September 10th – each year since 2003 – globally and here in Waterloo Region. In 2014, the theme of World Suicide Prevention Day is ‘Suicide Prevention: One World Connected.’ The theme reflects the fact that connections are important at several levels if we are to combat suicide. Here in Waterloo Region, we will be hosting a charity barbeque and music by Craig Cardiff starting at 4:30. There will also be a community information fair in the Rotunda beginning at noon which you will be able to connect with different organizations across the Region and receive information on services. 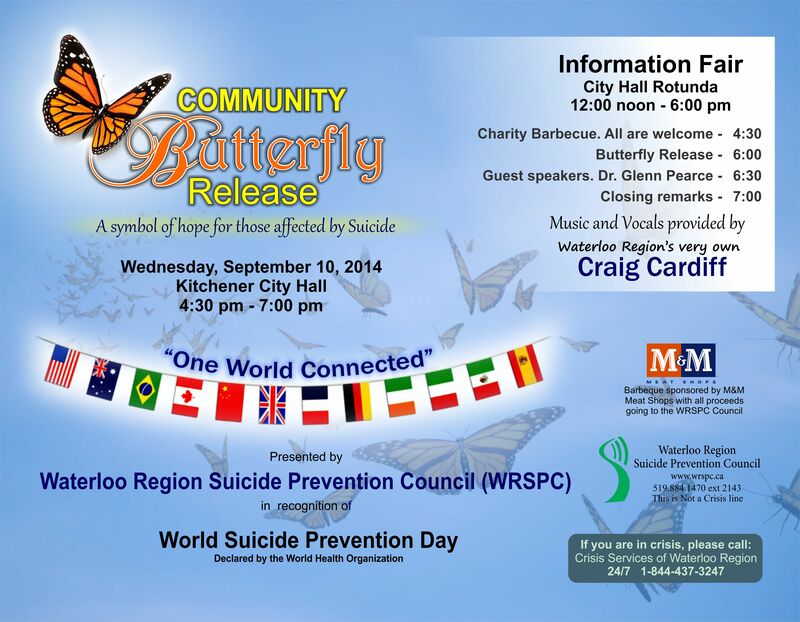 The annual butterfly release will take place at 6:00 in the back garden of Kitchener City Hall near Duke St. This special ceremony honours those lost to suicide and brings people together. We will also hear from a local family physician, Dr. Glenn Pearce, who has been working diligently with the Council to bring suicide prevention training and education to fellow colleagues.